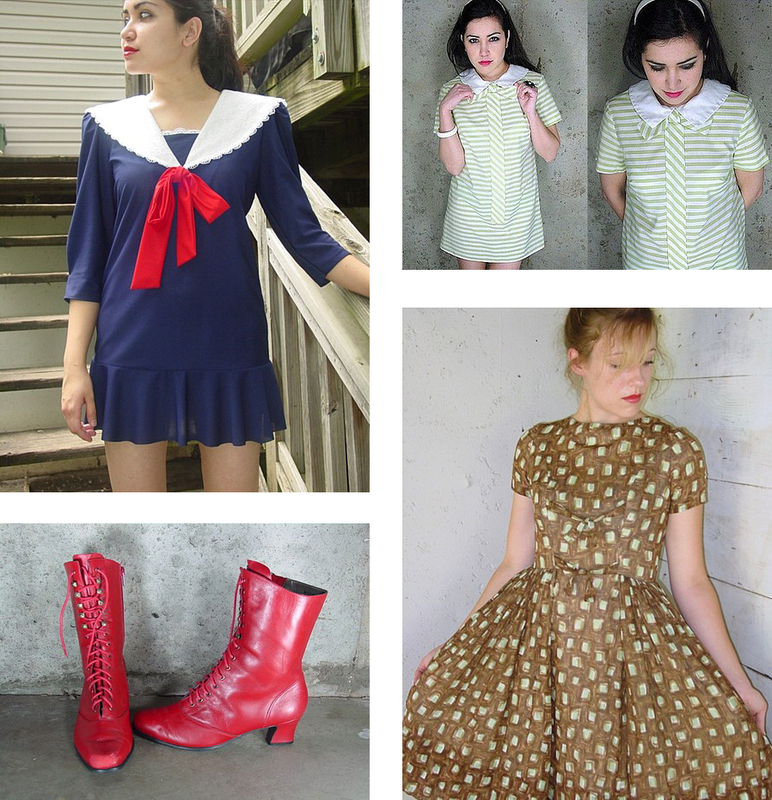 KANSAS COUTURE: Dirty Betty VIntage Giveaway! Up for grabs is a $30 credit to Dirty Betty Vintage! You know the drill: leave a comment on this post between now and next Sunday, August 1st, at 11 p.m. central time. Only one comment per person, please. Open to international readers. A winner will be randomly selected and announced next Monday, August 2nd. I haven't heard from the winner of the last giveaway: Megan, comment #1. If I don't hear from her by this Friday, another winner will be selected! Awesomesauce! I love that sailor dress. I love the brown floral dress!!!! giveaways are so awesome ! I love the sailor mini. love the "pops her bubblegum" mini!!!! International readers? That's me! Well, only one of many. Please pick me. Oh dirty Betty features such lovely colors! Drooling over chocolate suede boots. Mmm! Thanks for this giveaway! I've been loving me some "Dirty Betty Vintage"! I love the vintage dresses on their site! I love your blog and usually don't comment on the giveaways, but this time I'm going to give it a shot! :) Thanks! Ooooo! Crossing my fingers! I need a new dress! Great clothes - love your blog! Thanks for the giveaway! It would be awesome to win! Cute stuff! If I wasn't on this "don't buy clothes for a month!" thing I would be so tempted to buy the polka dot sundress. It's only $10. Ahh, so tempting. I'd love to win the certificate, and you would definitely hear from me! ahhh i'd like to enter! Oh, this is awesome! Consider me entered! Fingers crossed! I'd love to win. Holy cannoli! If those red boots are up for grabs, I'm definitely entering. Gorgeous. Will I get lucky for once in my life?! giveaways are the bee's knees. Dirty Betty Vintage has the cutest dresses. I love it! Loving the rainbow clutch. Fingers crossed. So many cute things to choose from! Those red boots look like they're just DYING to find their way to my feet! I am loving the Dirty Betty IS A DEBUTANTE Mini dress! Awesome vintage dresses! Thanks for the giveaway! I love gift card giveaways. Great site! I only wish those black pirate boots were my size (sigh). I love the STARING AT THE SKY Babydoll. So cute! one of those babies should come to Argentina!!! love the blog! love the giveaways! Cute top, purse & shoes! great stuff! thanks for the inspiration. already planning outfits! that gold dress is DIVINE. I'm a fairly new follower. Thanks for the giveaway! There are some great things in that shop! I love the red victorian boots!!!! Love those vintage looks! So cute. Yay! I love being introduced to new etsy shops! Thx! Great post - I heart these dresses. Especially loving the sailor dress, too adorable! what a great shop. Love all the nautical collars. I love many things at this shop. Many. great giveaway...wish those red granny boots were in my size! Wow, this shop has so many things that I want! Great giveaway! hooray for vintage! hooray for giveaways! Oh, sorry. I just drooled all over your post. Let me...just wipe that up. How embarrassing. Hopefully I'll win a giveaway. Diggin' the dresses and boots here. The sailor dress super cute. Thanks for the contests you always take care of your viewers. Those boots are beyond fierce! Oooohhhh, there's some fabulous stuff there! Both clothes and some rockin' shoes! Pretty reasonable prices, too! i love love love the striped dress/shirt.. oh the opportunities! fantabulous blog, i love reading it! I bought the red boots without waiting to find out if I won...could not resist. Plus, I'm always happy to buy from local sellers! Love it! Loads of great items!!! WOOHOO!! I would LOVE this! fashion giveaways are the best.